The shape of this piece is unknown in the underglaze black repertoire, but found in the so-called 'brown and pearl' wares. 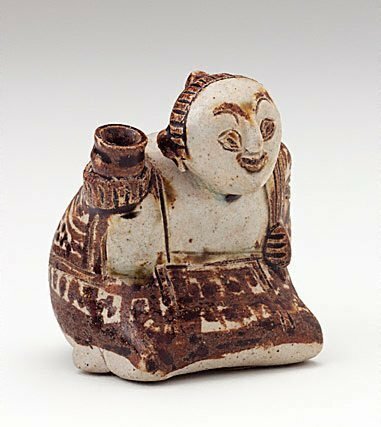 This characteristically small example is an incense holder in the form of a kneeling woman. Miniature wares are a hallmark of Sawankhalok, and not found in the more limited Sukhothai repertoire. Excerpt from The Asian Collections, AGNSW, 2003, pg.329.